Powerex has led scroll technology since 1991 when they introduced the first completely oil less scroll air compressor. Their technology and expertise in clean, dry air systems is unmatched. Powerex Scroll air compressors are designed to supply continuous oil-free air by using the most advanced scroll technology. 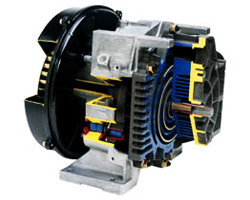 The rotary scroll compressor has few moving parts making it reliable and easier to maintain. The self lubricating tip seals and absence of a gearbox means the pump is truly 100% oil free. The Powerex Oil-Less Reciprocating compressors have been designed and tested to meet the most demanding specifications in the pneumatic oil free industry for reliability. Powerex oilless pumps use composite piston technology, low compressor speeds and PTFE compression rings for low maintenance costs. This advanced technology will provide oil-less air reliability for years to come. Tank mounted, base mounted and complete packages are available.